By 1910, World Color Printing was evidently having trouble attracting cartoonists. They had taken to signing house names to some strips so that it didn't seem like the whole Sunday section was produced by just a couple guys. Once in awhile, though, WCP would manage to pick up a new cartoonist, like Plaschke here. Plaschke (who usually signed his work Plas, as you can see above) looked like he could have been a good pick-up. 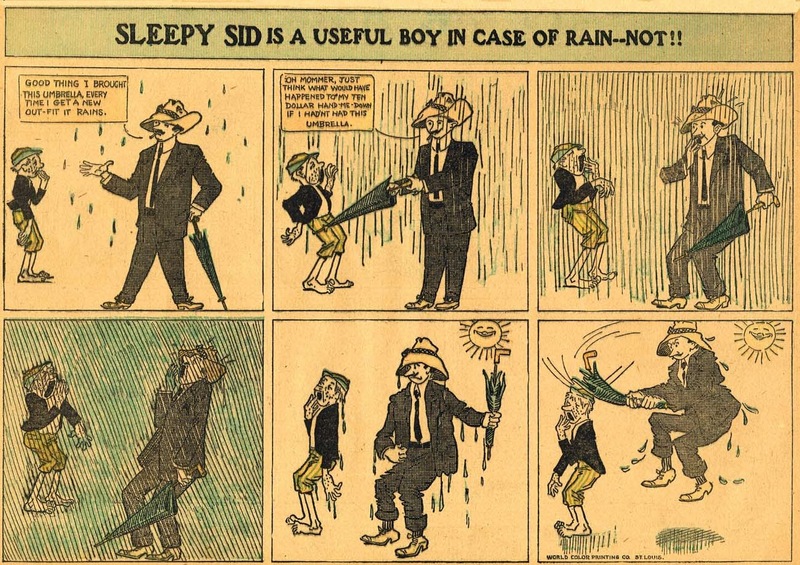 His one and only strip for the syndicate, Sleepy Sid, had a pretty lame premise but the early art was appealing in a raw-boned way. 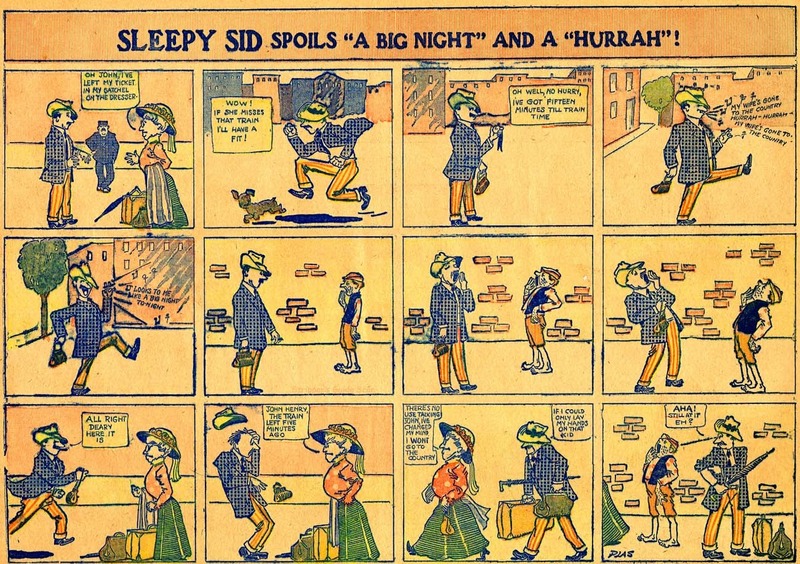 Plaschke's early strips, represented by the top sample, are oddly colored but I find the two-dimensional tableau effect interesting -- I presume it was intentional. Soon, though, as Plaschke got into his groove, the art was simplified (see sample #2). Plaschke is better able to portray physical action, but seemingly at the expense of any real discernible style. Later still (sample #3) Plaschke is trying to inject a little style again, but succeeds in just making figures angular. The premise has been made more interesting, though, with the infectiousness of yawns now driving the gags. Still not a great premise, but at least more original. 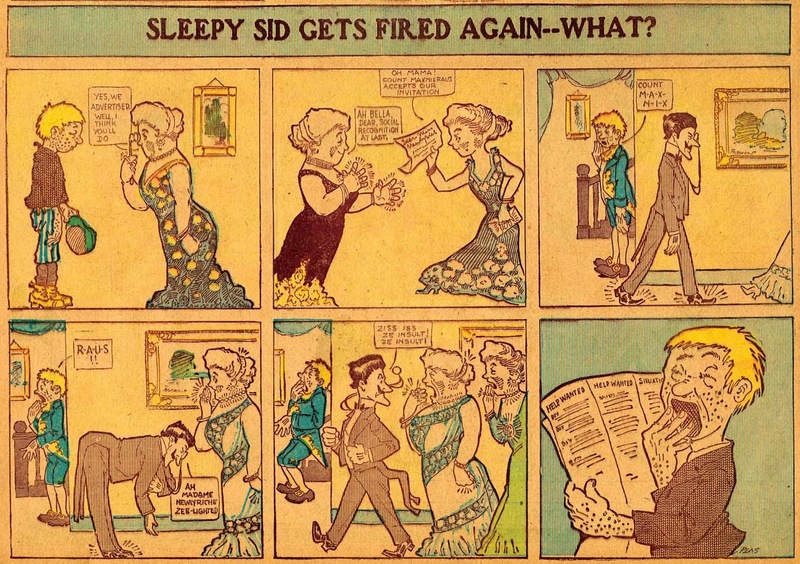 Later in the series still (sample #4), Plaschke seems to be so unhappy with his cartooning that he quit signing the strip. He's still using the angular lines, but is rushing so much he doesn't even bother drawing a horizon line, much less a real background. The gag, which presupposes a rain shower so sudden and intense as to drench someone in the interval of a yawn, is pretty lame. Plaschke has had enough. 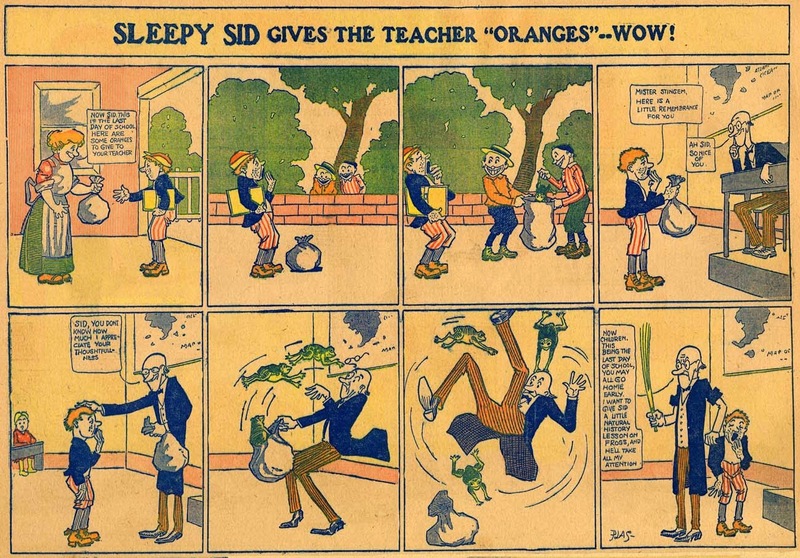 His Sleepy Sid series ran from April 3 to December 18 1910 in the World Color Printing section, and as far as I know, that's the only comic strip series to his name. Plaschke went on to a career in editorial cartooning. More about him tomorrow, with Alex Jay's Ink-Slinger Profile. What exactly happens in sample #1? It looks like the Count feels insulted by hearing Sid spelling his name. I don't get that. RAUS is a German word meaning OUT -- usually used as a not very friendly command, as in GET OUT!